So you just bought a new house and for the first time ever, you have a garage! You might be relishing the new storage space, but you also might be unsure about what to store in it. Aside from your car? Maybe some lawn chairs? You roof rack? What else goes in a garage? Alternately, you may be dealing with the opposite problem: a garage that over the years has become a room-sized junk drawer for all manner of clutter. If you’re wondering how best to use the extra space your garage provides, here are some guidelines on what to store in the garage. If you have a car, it probably spends a lot of time in your garage or parked nearby. So it’s only logical to store in your garage anything you use for your car, like wiper fluid and tire inflators. The garage is also a good place for items you often transport in or on your car, like a roof rack or camping gear. If you have the space, try to hang items like roof racks on the wall or ceiling of your garage. They can be large and awkward so getting them out of the way is important. As for smaller items like extra wiper fluid and tire inflators, these can be stored within your garage storage system. You system can be as simple as a plastic storage rack with bins or a full-on garage cabinet. The garage is the ideal home for tools and appliances you only use outdoors. Think shovels, hoses, extension cords, lawn mowers, gardening tools, extra pots for flowers and so on. 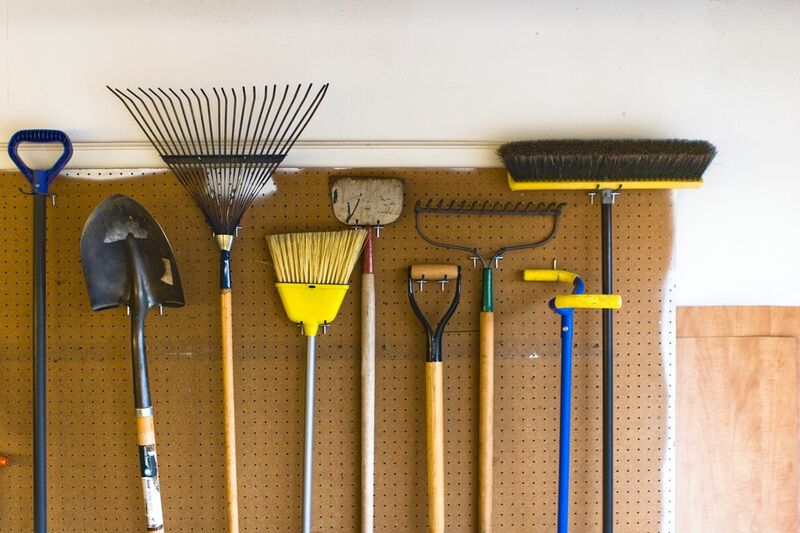 Bags of potting soil, buckets of ice melt and other outdoor supplies that come in bulky packaging are also good candidates for garage storage. If you find you don't have enough room, you may want to invest in a shed. Any product made for outdoor entertainment has already proven it can withstand the elements, so go ahead and keep it in the garage when it’s not being used. This includes toys for kids (or adults) to play with in the yard or pool, extra patio furniture or plastic chairs, pool or hot tub supplies, bicycles and the like. This kind of stuff can get messy if it’s just stashed in an empty corner, but there are plenty of creative yet simple garage storage ideas to keep the space looking nice and neat. Hang lawn chairs on the wall, fasten pool and patio supplies to the ceiling with an overhead garage storage rack. If you can't fit these items in your garage, try a basement or shed. If you need to store any items you rarely (or never) actually use, the garage – like the basement or attic – is often a great place to hide it away. Just keep in mind that sturdy, weatherproof objects will do better in the garage, while more delicate items, like documents and electronics, will hold up better in a basement or attic. This leads to the related, and perhaps more important, topic: what not to store in the garage. These items fall into three main categories: materials that could ignite or are otherwise dangerous, items that will attract insects or vermin, and delicate objects that could be ruined by fluctuating conditions. In addition, there are a few things that sound like they belong in the garage, but, for a variety of reasons, should be stored elsewhere. You may have done the work to well insulate your garage (think: weatherstripping, fixing and old garage door so it doesn't let air escape), but your garage is exposed to outside temperatures more than the rest of your home. Don't store anything in the garage that you wouldn't store in the trunk of your car. it's gets hotter than your house and it gets colder than the rest of your house. Keep propane tanks, which can leak and ignite, out of the garage (and other enclosed spaces). Store them outside, in a well ventilated area, instead. Always be careful with flammable or hazardous materials. Gasoline, for example, can be stored in a garage, but make sure to use approved containers and keep them off the concrete floor and far from ignition sources and curious children. If you’re holding onto hazardous materials you no longer need, it’s better to be safe than sorry. Take the time to dispose of them properly, rather than sticking them out of sight and out of mind in the garage. If rodents or bugs can make a meal or a home of it, think twice before storing it in your garage. This includes clothing, bedding, books, papers, firewood and food – including pet food and birdseed. Depending on where you live, items in your garage can be exposed to extreme or fluctuating temperatures, moisture, humidity, dirt and dust. So consider storing cans of paint, items that have been painted, such as furniture or artwork, canned food, wine, electronics, photographs and wooden furniture, which can warp in the heat, indoors where they will be more protected. A garage might seem like a good place for an extra refrigerator or freezer. But in hot temperatures, they’ll have to work harder to keep food cold, which means your energy bill will be higher than it would if you kept the appliances in the house. A garage can also feel like a handy solution to a cluttered home; it’s tempting to just shove all your unused stuff into the garage, where no one will ever see it. But don’t let it happen. For one thing, it doesn’t really solve the problem of why you’re accumulating clutter. For another, maintaining an organized garage is safer and more convenient than hiding a mess behind that automatic door. Finally, don’t risk storing things that are worth a lot to you, either monetarily or emotionally, in the garage. In addition to being more vulnerable to weather, a garage is easier to break into than a house or apartment. So if there’s anything you wouldn’t leave lying around in a hotel room or parked car, don’t leave it in your garage either.